When the Mexican government planned the implementation of a second-generation satellite system, it turned again to Hughes Space and Communications Company. The new pair of spacecraft is called Solidaridad, signifying the way satellite telecommunications are uniting the urban and remote parts of the country with one another and the rest of the world. These replace the two Hughes-built Morelos satellites, the first of which was retired in 1994 after nine years' service. The Solidaridad contract was signed in May 1991. The spacecraft are operated by the government agency Telecomunicaciones de Mexico (Telecomm). Hughes provided two Hughes HS-601 model high-power spacecraft, associated ground equipment, and training. The first satellite was launched Nov. 19, 1993, and the second was Oct. 7, 1994, on Ariane-44LP H10+ and Ariane-44L H10+ boosters respectively from Kourou, French Guiana. 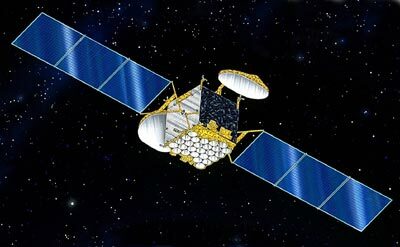 The Solidaridad contract calls for a satellite life of 14 years. To accommodate the high power and capacity Telecomm demands of Solidaridad, the new spacecraft differ markedly from Morelos. Solidaridad is a body-stabilized spacecraft. It consists of a cube-shaped center portion containing the electronic and propulsion systems, and, along the north-south axis, a pair of three-panel solar array wings that total almost 21 meters (68.8 feet) in length. Each spacecraft weighs about 1641 kg (3610 lb) at beginning of life on orbit. Its solar arrays provide 3300 Watts, and a 27-cell nickel-hydrogen battery provides power during eclipse. Like Morelos, each Solidaridad spacecraft carries 18 active C-band transponders, but with much higher power that allows reception by small terminals. Because the transponders serve various regions, they are powered by Hughes-built solid-state power amplifiers (SSPAs) ranging from 10 to 16 Watts. There are 16 active Ku-band transponders--four times the existing capacity--with 42.5 watt traveling-wave tube amplifiers. In addition, Solidaridad has one L-band channel for service to users traveling by land, sea, or air and in rural areas. This service has four 21 watt SSPAs linked in parallel. All bands cover Mexico, and the C- and Ku-band coverage extends into the southwestern United States. In addition, spot beams in Ku-band reach such major U.S. cities as Chicago, Dallas, Houston, Los Angeles, Miami, New York, San Antonio, San Francisco, Tampa, and Washington, D.C. C-band coverage includes the Caribbean and Central and South America. With the antennas deployed the spacecraft are 7.2 meters (23.5 feet) across. The C-band antenna is on the west side of the spacecraft and Ku-band on the east. Both are 2.4-meter by 1.8-meter (8-foot by 6-foot) oval X-wing antennas with two reflecting surfaces, one of which is sensitive to vertical polarization and the other to horizontal. A 26-element L-band cup dipole array covers the earth-facing side of the spacecraft. Solidaridad's antennas and solar panels fold up alongside the body for launch, forming a cube 2.7 meters by 3.5 meters by 3.1 meters (8.8 feet by 11.6 feet by 10.1 feet). A flight-proven bipropellant propulsion system features an integral 490-Newton (110-lbf) Marquardt liquid apogee motor, plus twelve 22-Newton (5-lbf) thrusters for stationkeeping. Solidaridad suffered failures of its satellite control processors (SCP) in 1999 and 2000, leading to a total loss.